Several years ago, the Horwich Fine Dining Society was founded. It consists of just four people; my husband and I, and our best friends Wayne and Vicki. It started by planning day trips to Michelin starred restaurants in the North West of England. We generally tried to do one a month, which was nice as it meant we went to the Lake District regularly! We were soon looking for something more, so began to drift further afield. When my husband and I got married, we hated the idea of hen and stag outings so decided on a 'hag' do instead. The Horwich Fine Dining Society made a road trip to Bray for lunch in the Hind's Head and then dinner at the Fat Duck. We were married abroad, but when we returned we hired the private dining room at Northcote for our intimate reception. Since then we have travelled far and wide in search of culinary excitement! 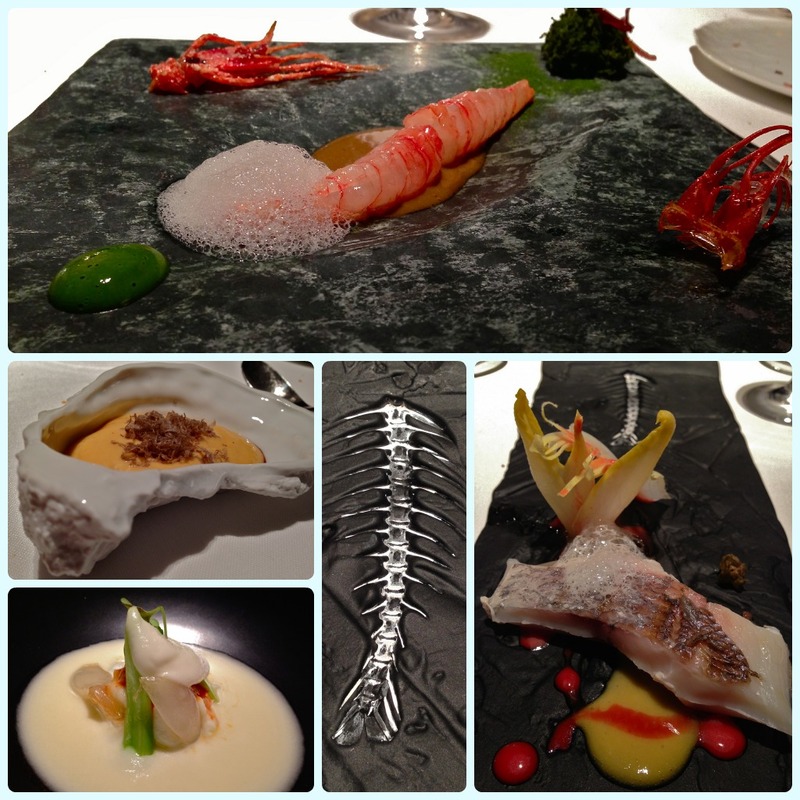 El Celler de Can Roca holds the prestigious three Michelin stars, and was also re-elected as the second best restaurant in the world in the 2012 World's 50 Best awards. 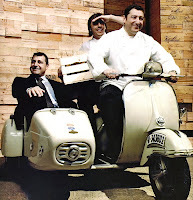 The Roca brothers could literally rule the culinary world. It's most definitely a family affair. Josep is their Sommelier, Joan the head chef and Jordi the pâtissier. They grew up in their parents' restaurant, practicing perfection from an early age. 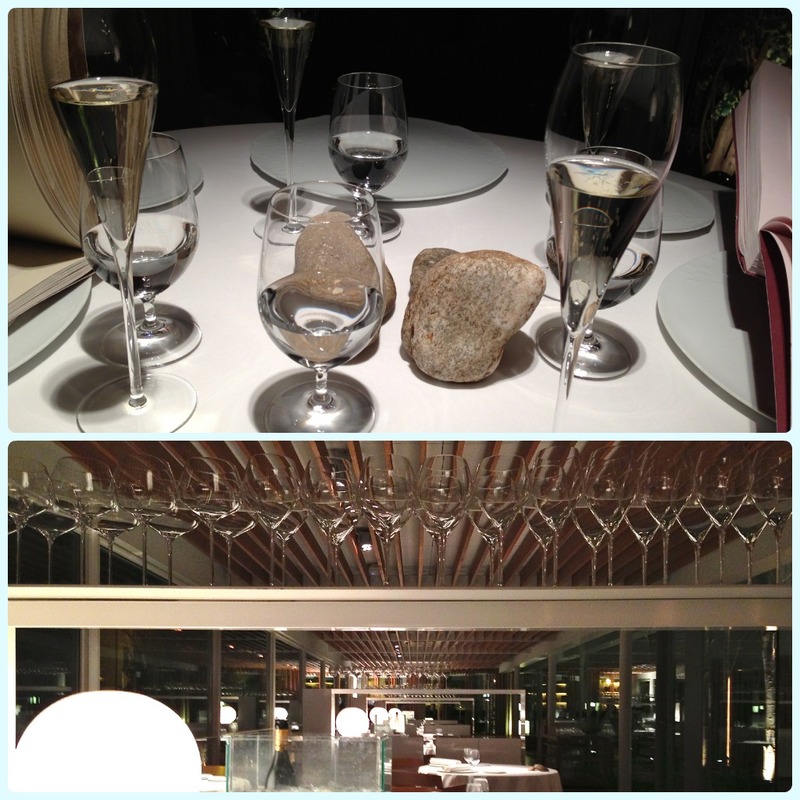 Each table in their restaurant has three rocks in the centre; one for each Roca (which translates to rock in English) brother. Even the 'R' in their logo has three tails. Being OCD with the number three, I like this a lot. Our reservation for dinner was at 9pm. The restaurant only opens late so we were actually the first to arrive. The building looks like an old Spanish villa, surrounded by perfectly pruned trees and walls decked with old timber. You have to walk through a garden lounge to get to the main restaurant. A wonderful fire pit roared in the middle of comfortable seats, which I imagine is a lovely place to sit when it's not -1 C! The walls of the restaurant are made of glass, so they overlook this pretty courtyard. First came a corrugated cardboard globe, held together with a black satin ribbon and a fanfare of 'ooh' and 'ahh' from our table. The globes were removed to reveal five small balls which represented cuisines from around the world, covering Mexico, Morocco, Peru, Japan and Thailand. I think my favourites had to be the wasabi flavours from 'Japan' and the sublimely sweet yet warming spices from Morocco. Each was just a bite but was perfectly formed. Cheeky. A spoon was placed on our plates with a long, smooth, olive green wibbly thing on it. We were told to eat it in one go because it was actually liquid inside. I didn't fancy its texture at first, but was soon a fan of the thick artichoke cream served just warm. It came with hard shelled bon bon with a liquid centre and the most amazing 'crisps' I have ever tasted. Imagine a prawn cracker meets something sweet and salty all in one go. I could have gone for a bowl of these! 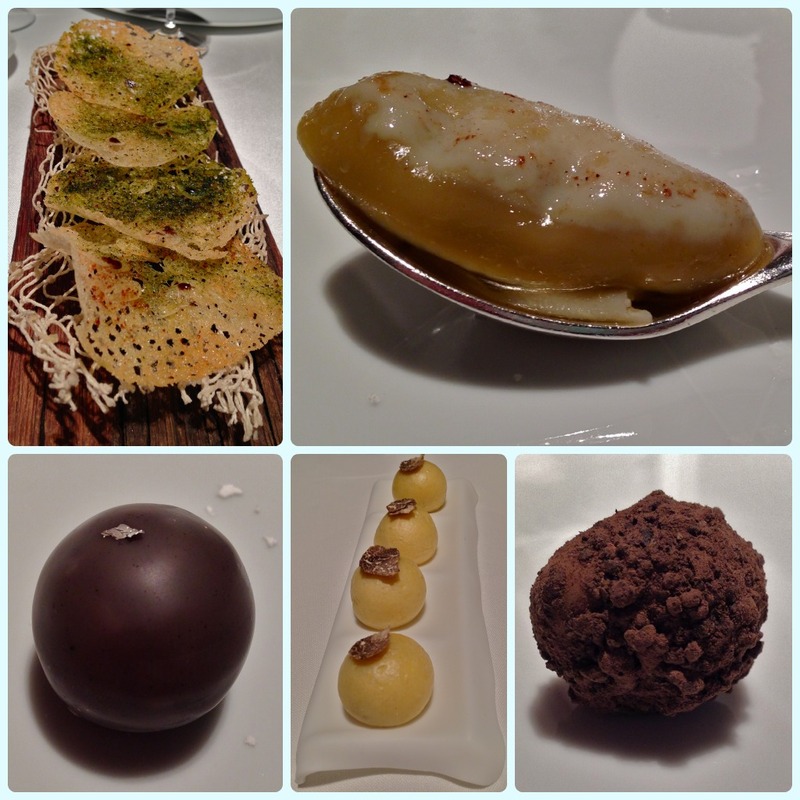 The next two were truffles in different guises. Truffles are one of my mortal enemies as they cause me to have a storming migraine. I sniffed the chocolate truffle and decided it didn't smell that strong. I was going in. Mistake! For those of you who are truffle fans, you would be all over this. I on the other hand had to neck my champagne to get rid of the taste. You can take the girl out of Horwich... I donated my cream truffle ball to my husband. Crisis averted. I always get over excited about bread. 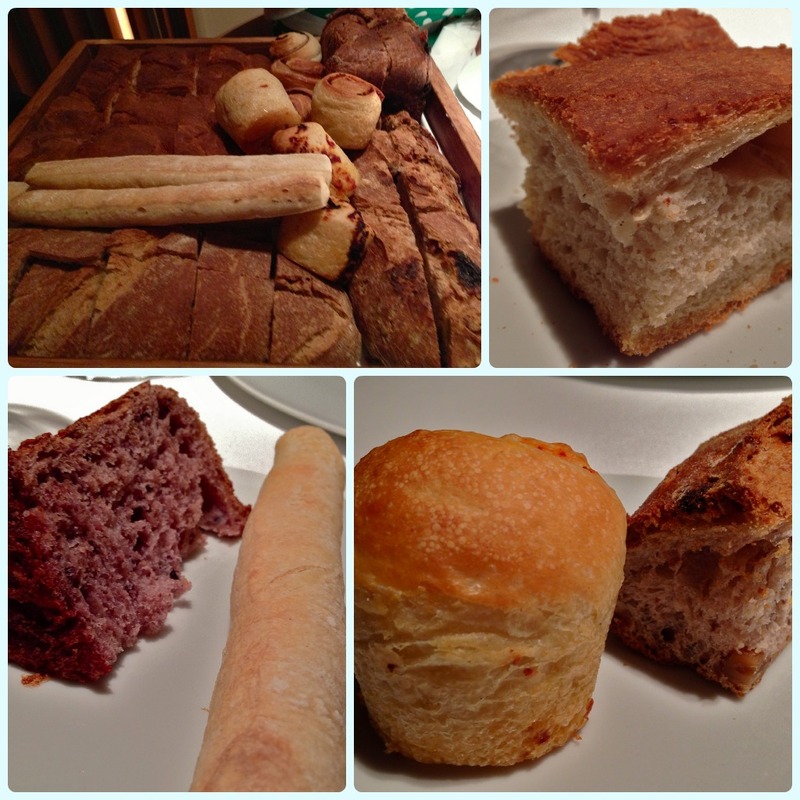 I have been to some fantastic restaurants, only to be disappointed by the bread. Vicki has a one slice rule. I have no such restraint. My favourites include the huge selection at Fraiche, the Lancashire cheese rolls from Northcote, the black treacle buns from Sat Bains and the simple split loaf from Noma. Look at the tray below... wholemeal, mini baguettes, red wine bread, apricot and walnut, tomato rolls, black olive rolls and one that tasted a little like brioche. My favourite had to be the tomato one. Soft like a croissant but not quite as buttery, with a strong tomato paste rolled into the dough. I loved these! Just look at that colour! 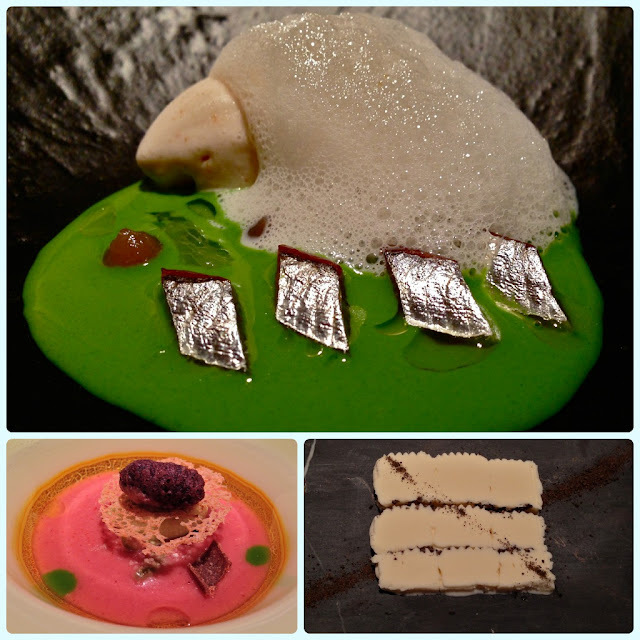 Green wheat with smoked sardine, grapes, toasted bread with olive oil ice cream and yeast foam. I started to taste bits individually at first, but then decided to eat a little of each together. What's really clever is the taste combination. On their own they are pleasant. Put them together and they take on a completely different form. It's like some components of the dish are there to season rather than to add flavour of their own. The pretty pink dish below was 'olive paste'. This was black olive gazpacho, spicy gordal-olive mousse, black olive fritter, manzanilla-olive ice cream, toasted bread with oil, fennel jelly, winter savoury jelly and picual olive. This was a lesson in 'turns out I actually like olives'. The texture of that black olive fritter was heavenly. The next dish was a little bit of fun! Remember over Christmas when I kept banging on about Viennetta being ace? I was mocked like a common fool. Well... How about this? White asparagus Viennetta! I'm obviously bang on trend without even knowing it... I'm not mad on savoury ice cream, but this was delicate and really thick in texture. Genius. We then moved on to the section which sits in the 'fish course' territory. I only ever eat fish on tasting menus. Lots of people tell me they hate this or that, so could never have a full tasting menu. I like the fact a tasting menu makes me try new things. I may not always like them, but sometimes I am pleasantly surprised. First came a porcelain shell filled with oyster covered with game meat (pigeon) hollandaise sauce. Oysters are not my bag, so it was donated to my husband. However, that game hollandaise was a tour de force! Gorgeous. The masterpiece below is another signature dish; a whole prawn served with head juice and seaweeds, seawater and sponge cake plankton. See those red things...? Caramelised legs and pincers. I tried them, but that was a little too much for me. I draw the line at eating pincers. Supportive as ever, the rest of the HFDS found this hilarious. My husband put a leg near my hand whereas Wayne decided to have a pincer sticking out of his mouth. Vicki did not take part in these limb shenanigans. 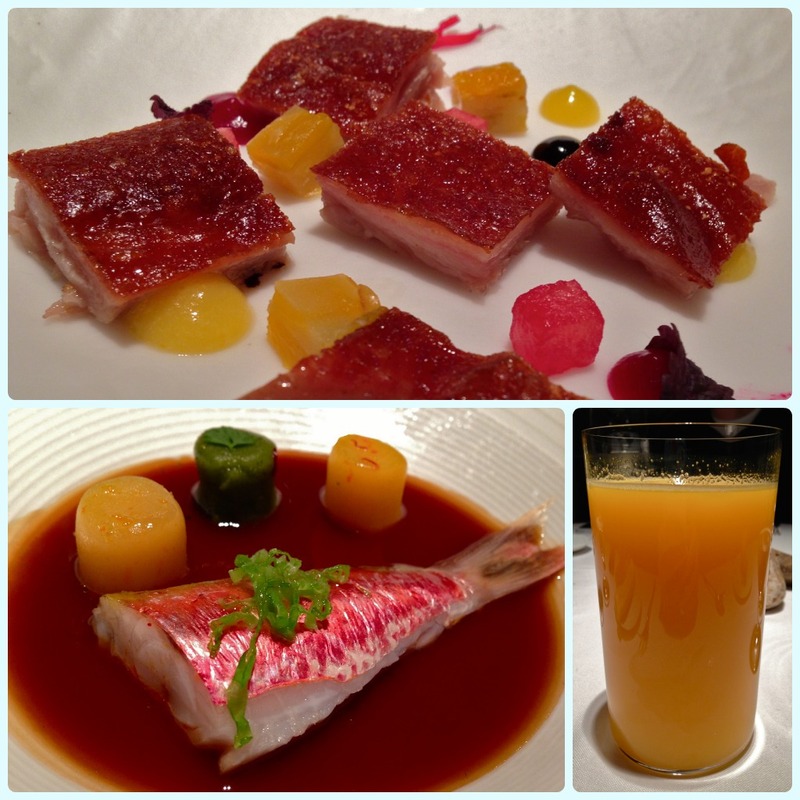 The red sea bream with endive, gentian and citrus was much better! Soft, delicate fish with bitter leaves and a sweet sauce. Plus, it was served on a very pretty plate with faux fossils lined with silver. Each one was different too. The salt cod brandade consisted of braised salt cod tripe, salt cod foam, olive oil soup, shallots and honey, thyme and chilli pepper served with 'vegetable contrast'. The olive oil soup was just divine. Not at all greasy, I'm sorry to say that we all mopped this up with our remaining bread. We are from Horwich. Cut us some slack. We then moved onto the classic 'main' type dishes. First was the Iberian suckling pig blanquette, Reisling with mango terrine, melon and beetroot, beetroot puree, black garlic, onion and orange concentrate. Jesus wept this was good. We had something similar at é by José Andrés in Las Vegas, but this one had a beautifully caramelised topping. Beetroot is normally mortal enemy number two, so I was a little fearful of this dish. Once again, the combination of flavours when eaten together was just brilliance. Sweet skin, bitter orange, fresh melon and earthy garlic and beetroot just made the whole thing pop! When a fish tail was put in front of me I could have squealed. I don't like my food to look like animals. Saying that, this is why I like tasting menus. They make me try it. If allowed to be, I am a very fussy eater. This was served with vegetable gnocchi and a wonderfully meaty sauce, This might have been referred to as 'gravy' at one point. No, not by the waiter. I am so glad I tried this! Soft and sweet gnocchi with delicate, slow cooked fish. Just look at the colours! It may seem odd putting a picture of orange juice on here. I don't drink wine (I know...) and drinking spirits with a meal leaves me with the fear of being hammered whilst everyone else is still sober. Our sommelier offered to make some freshly squeezed orange juice instead. It was so good the whole table tried it. The only problem is, I can never drink orange juice ever again for fear that it will taste rubbish in comparison. Damn you and your Spanish oranges. There's something quite exciting about a glass cloche filled with smoke. Even though we were suffering from food fatigue at this point, our senses were reawakened by the scent of intense barbecue coals. This dish was charcoal grilled lamb breast fillet with sweetbreads and eggplant, coffee and liquorice. Thankfully this was quite small, otherwise we may have dropped dead on the spot, knowing we still had pigeon and desserts to follow. Although it was small, flavours were intense. I donated a little of mine to my husband (he's an excellent Dusty Bin). The pigeon was accompanied by liver and onions (a thick sauce underneath), curry caramelised walnuts, juniper, orange peel and herbs. 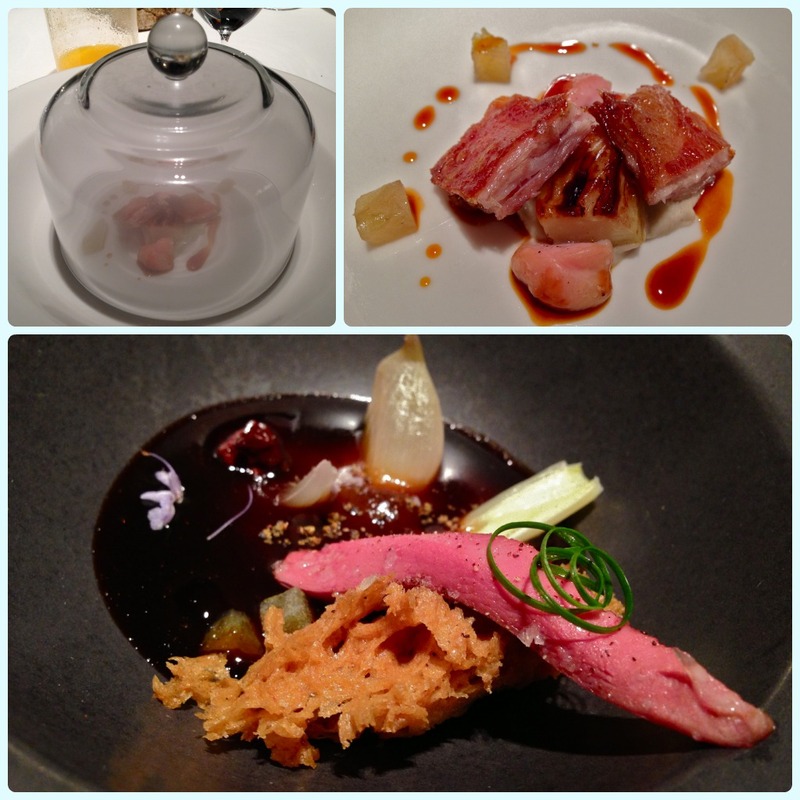 Because pigeon is quite a strong flavour, nothing in the rest of the dish was too over powering. I particularly liked the soft onions and curried walnuts. Just look at this first dessert. I'm by no means religious but I'm telling you now, if I was that snake and was faced by an apple like this... I'd have eaten it myself. Eve would have had no bloody chance! Shiny, bright and sparkly... it's the stuff fairy tales are made of. I'm now beginning to understand why Snow White ended up poisoned. How could I resist? Girona's fair candy apple is served on a bed of candy floss. It was demolished within seconds. Gone. Still reeling from the shock of sugar several ways, the next dish was chocolate with milk consomme, butter ice cream, praline cream and chocolate candy. We all agreed it was very much like a chocolate Mini Milk! 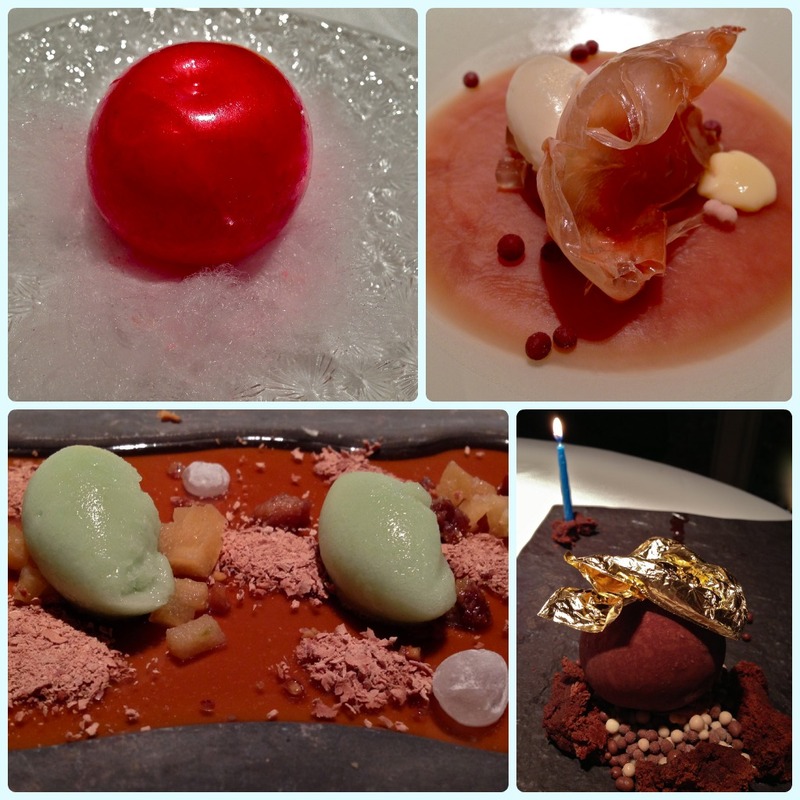 This dessert really helped to cleanse the palate after consuming so much sugar. The last of our desserts was maple syrup cream with pear, walnut and cardamom. By this point we were almost dead. I think I managed half! The pear sorbet was just beautiful. I would never think of putting it with maple syrup, but it just worked. The little white 'rocks' were a crisp shell encasing some sort of spirit, possibly calvados. Next appeared a beautiful birthday 'cake' for my husband, complete with candle! This was a crisp chocolate ball filled with gooey chocolate wonderful stuff, surrounded by little rounds of chocolate and crumbled brownie, topped with gold leaf. At this point in any tasting menu I am fighting two emotions; despair at the thought of having to eat ever again, and exhilaration at the thought of petit fours. 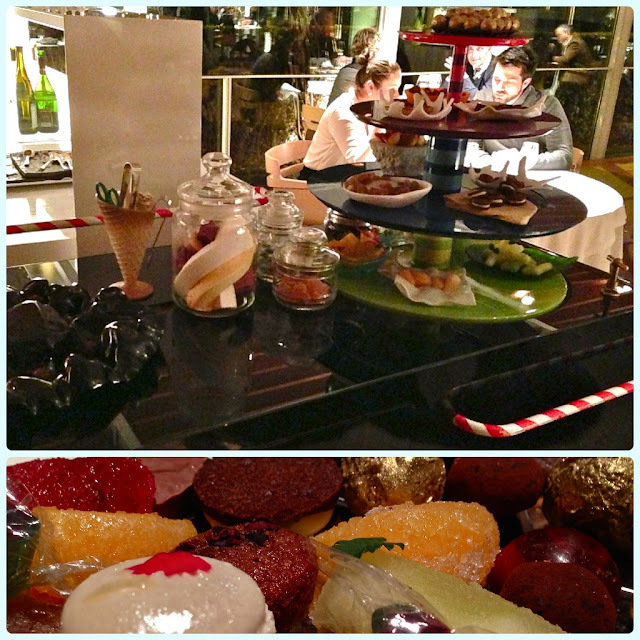 Having seen the trolley filled with mini delights, I knew this was going to be something special. 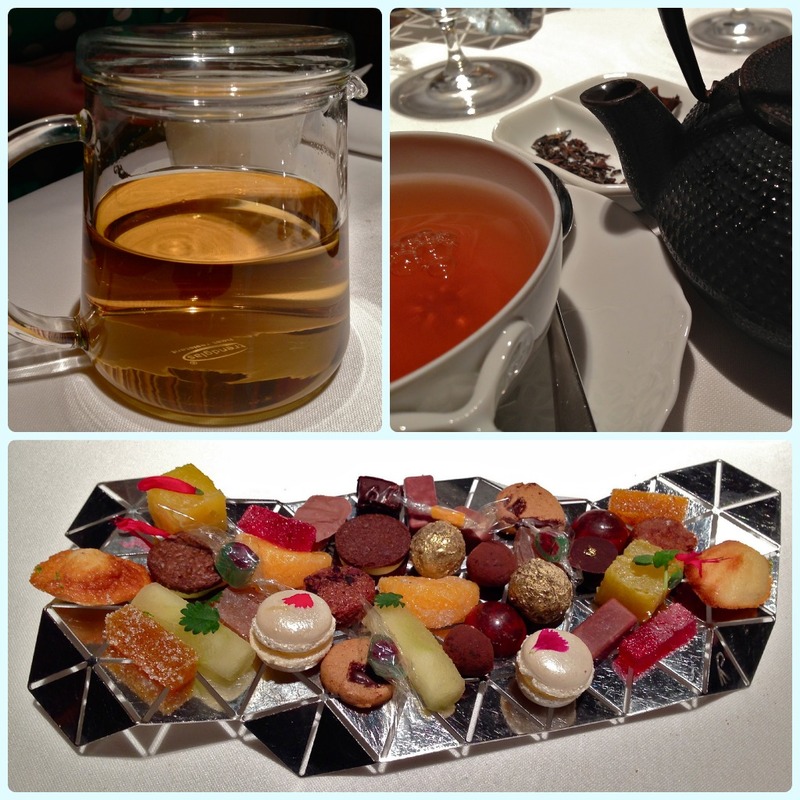 Our tea and coffee came with the best selection of petit fours I have ever seen. I cannot imagine anywhere ever beating this. It was a mixture of home made boiled sweets, madeleines, cookies, jellies, macarons, candied fruits and truffles. They went perfectly with my 'Super Fancy Oolong' tea. I'm not even joking. That was its real name. 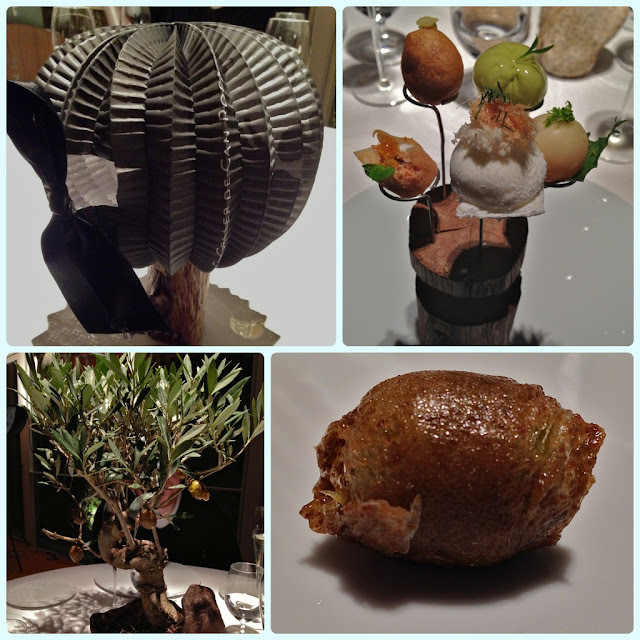 Out trip to El Celler de Can Roca will go down as one of my favourite meals ever. 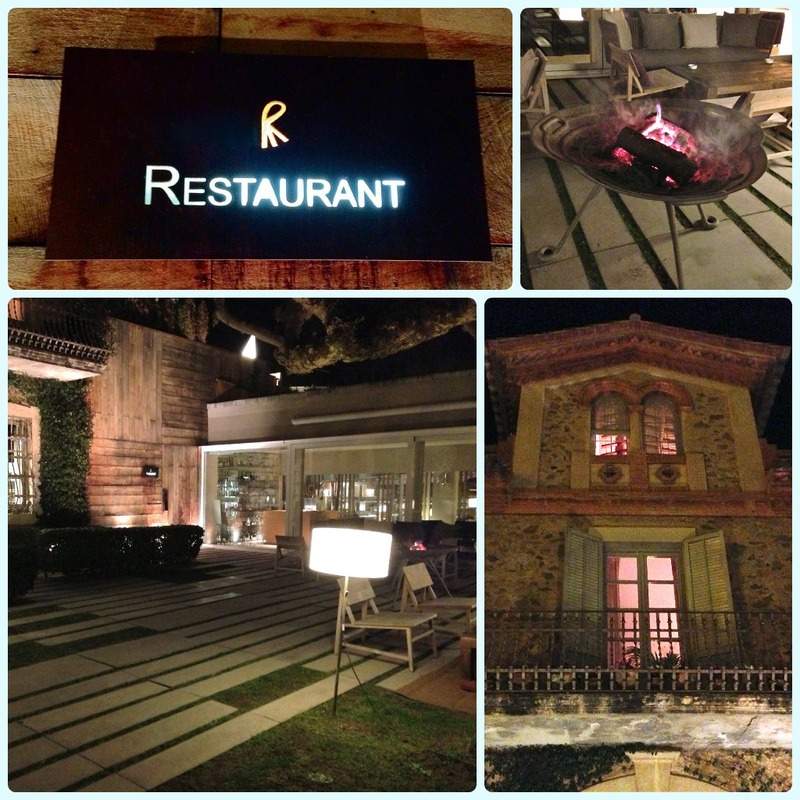 This isn't based on its star rating or what position it came in the World's 50 Best, but because it was made special because of good food, lots of surprises, amazing surroundings, welcoming staff and going with my favourite people. I loved every minute of it. Thank you so much for posting. It all looks amazing; the candy apple is perfect! El Celler de Can Roca has been on our list for a long time, and we've not had chance to arrange anything yet, but your post makes me more determined to get there soon! I'd book now! I think there's something daft like a 12 month waiting list for weekends and 6 months for during the week. Crackers! It looks fantastic! 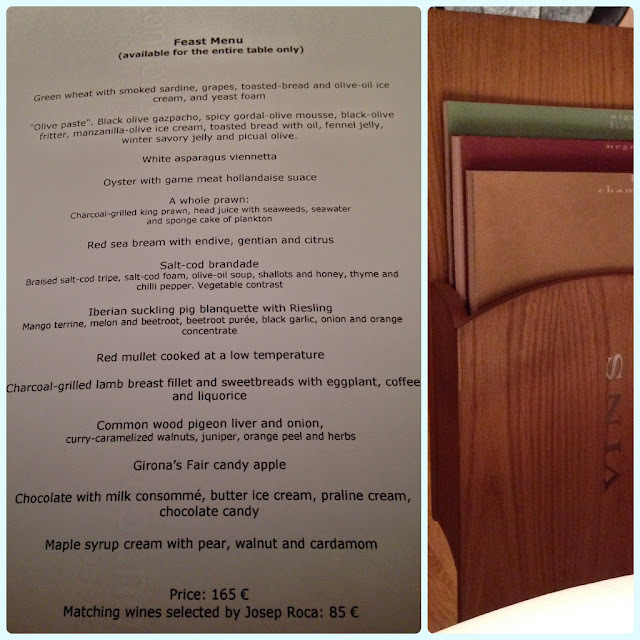 El Celler de Can Roca is for sure on my list of places to go! The food all looks fantastic but perhaps the suckling pig looked sooo melt in your mouth delicious, but then it all did! Ohhhhhh so stunning , great photos too. I`m there for my birthday in August so ill be letting you know again no doubt...just to rub it in haha. Thanks for a great little piece.